Mosquitos can be an annoying pest when you are trying to enjoy the outdoors, but many individuals are hesitant to use chemical-laden bug repellents directly on their skin. While there are many bug repellents out there, the best natural mosquito repellent for you might be one that uses a mix of natural ingredients and is free from DEET. To find the best natural mosquito repellent, we scoured the internet to accumulate feedback from countless customers who have tried a variety of different products. We also looked at the reputation of different brands, and the ingredients listed in their products. 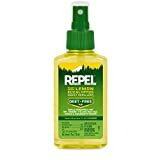 Finding a great natural alternative to traditional mosquito repellent turned up many options, but there were some clear winners based on the sheer number of reviews provided. We cross-referenced this information with multiple sites to ensure our recommendations offer the best of what is available. There are a number of DEET free mosquito repellents, and many of them include natural ingredients such as essential oils and other organic compounds. For those that prefer not to spray these repellents directly on their skin, there are also soaps and mosquito sticks that offer protection without any skin contact required. The Sallyeander cream is safe for infants, and a little bit of product goes a long way. It’s safe for use on infants, is DEET free, and is also made in the USA. 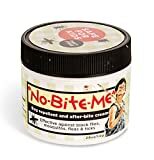 This cream can also be used as an after-bite cream and keeps away black flies, fleas, and ticks in addition to mosquitos. This product is handcrafted in small batches, and users report that it is not greasy, but it does have a pleasant smell and a delightfully creamy texture. This product, along with the others formulated by Sallyeander, is made from food-grade ingredients and is free from sulfates, artificial dyes, parabens, and other non-edible chemicals. Sallyeander products have been handmade in the US since 1982, and the company promises to use only olive and soy oil bases, never test on animals, and to not use coconut or palm oils. Many users report using this cream after showering as a moisturizer, and they find that application is needed again after a few hours outdoors, depending on the activity and the number of bugs. The scent is herbal and woodsy but dissipates somewhat not long after application when it has fully absorbed into the skin. This spray by All Terrain uses a blend of essential oils and is DEET free. The formula is safe for all members of the family and has been tested to ensure it is non-irritating to those with sensitive skin. This spray also won’t damage your clothing or camping equipment as many essential oil-based products potentially can. The repellant is non-toxic and friendly to the environment which makes it a perfect choice for outdoor enthusiasts and those who travel. The spray is ideal for use in outdoor applications such as camping, hiking, and other outdoor activities. The goal of the company is to create natural products that work as well as chemical-based products, and their skincare protection products are highly rated online. Users like that it doesn't have an overpowering smell and that it works for a variety of flying insects other than mosquitos. The spray has a texture similar to thin lotion which makes application easier and reduces the amount of product that is wasted. This spray comes in a family size bottle and is reported to work as a repellent for black flies, gnats, no see-ums, and other bugs. SMELLS GREAT and REALLY WORKS! See our Testimonials! 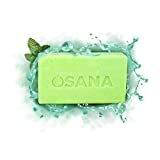 This all-natural soap from Osana is DEET free and contains 100% all-natural ingredients that are safe for kids and non-toxic. The company claims that you can shower with this soap in the morning and reap the benefits of its protection throughout the day. This soap is appropriate for daily use and is also free from parabens and safe for the family. Some users say that it smells like soap frequently found in hotels, and how useful it seems to vary based on the person and their environment. 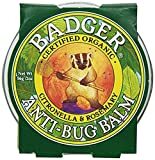 The Badger Anti-Bug Balm is a unique product that is DEET free, and lab tested to repel mosquitos and even stable flies. It's safe for the whole family to use and is certified to be petrolatum-free and organic. Users report that the balm has a citrusy smell that is pleasant and preferred to other essential oil-based sprays. It is also said to work as a deterrent for other bugs, such as fleas, gnats, and other small insects. Users recommend applying this balm to all areas of exposed skin as it not only repels bugs but works well to hydrate and moisturize skin. Reapplication will be necessary during the day, and some describe the product as being a little bit greasy if it is not adequately rubbed into the skin. The W.S. Badger Company is family owned, and their products are widely available in retail stores across the US. They are known as a certified B Corporation which allows them to use "business as a force for good," and their products have been cruelty-free since 2010. SAFE AND EFFECTIVE - No synthetic chemicals, DEET, or petroleum products, so it's safe for the whole family. The Badger spray uses a natural blend of wintergreen, citronella, and rosemary essential oils that are safe for the whole family and free from synthetic chemicals, petroleum products, and DEET. This spray is recommended for outdoor enthusiasts looking to protect themselves while hiking, camping, participating in outdoor sports, or dining outside. You’ll want to shake it well before each application and apply it often for the best effect. Users like this certified organic spray partly because it smells good, and also because it is lab tested for effectiveness. The family-owned company manufactures their products in the USA and has been around since 1995. They are well known for their business practices which focus on doing good, and their products have been certified cruelty free since 2010. 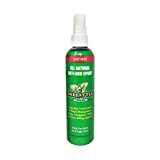 Skedattle is another DEET free spray that uses an all-natural formula that includes essential oils. What sets this product apart is its use of Vanillin which creates a pleasant scent. This product is safe for all members of the family and is even pet safe. Skedattle is also biodegradable and eco-friendly and won’t damage delicate fishing lines should the two come in contact during your time outdoors. These sticks by Murphy’s are DEET free and use natural plant-based ingredients to ward off mosquitos. The bamboo sticks are infused with rosemary, lemongrass, and citronella and burn for up to 2 hours. Many individuals that live in the southern part of the US report that these sticks are highly effective for them when used on their porch or patio outside. The approximate area that is treatable is a 10-12-foot radius from the incense stick. 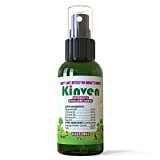 The Kinven mosquito repellent is a mix of essential oils that can repel insects for up to 4 hours before needing to be reapplied. It is entirely DEET free and is safe for all members of the family to use. This spray is recommended for all kinds of outdoor activities such as camping, while in the backyard, and all around the exterior of the home. This spray can also be applied to the Kinven brand braided bracelets to recharge their effectiveness. Instead of spraying this repellent on the skin, many users have found using the bracelets to be sufficient for avoiding insect bites. Users like the pleasant smell that comes with this spray which is made from peppermint oil, rosemary oil, clove oil, citronella oil, and geranium oil. 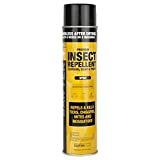 For those in heavily infested mosquito areas, it is recommended to re-apply this product every hour to prevent being bitten. Sky Organics repellent is certified USDA organic and uses a blend of different oils. It is free from alcohol, DEET and other chemicals and additives commonly found in other non-natural bug repellents. This spray comes in a bottle and is lab tested to deter mosquitos for up to 4 hours. It’s safe for all ages and pets, and the sturdy aluminum bottle is perfect for outdoor adventures. 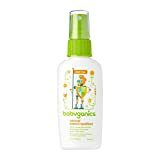 Babyganics insect repellent is a blend of citronella, rosemary, peppermint, lemongrass, and geranium that many find to provide a pleasant smell. Its DEET free, and is also free from sulfates, phthalates, parabens, and artificial dyes and fragrances which makes it perfect for a baby's sensitive skin. The drawback to this product is that it will need to be applied often to be effective as it relies on the scents of the essential oils it contains. Some have found the smell to be a bit much for them and have also described the product as oily. When looking for a natural mosquito repellent, there are a few characteristics that may be important to the overall effectiveness of the product. Many repellents are different mixtures of oils and natural ingredients, while others use different preservatives and other non-DEET chemicals. Each natural mosquito repellent brand will use its own blend of different essential oils that they claim will ward off mosquitoes, ticks, and other bugs. While this may have some effect, the mix of essential oils may vary from brand to brand and reading the ingredients may help you figure out what combination works best for you. It's also worth noting that these kinds of repellents will need to be regularly applied during your time outside as they wear off relatively quickly. These mixtures will also have a smell, and some individuals find specific brands to be more appealing than others. 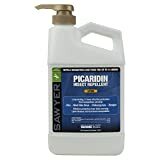 Picaridin has become a favorite repellent ingredient since DEET became known as being potentially unsafe for individual members of the family. In fact, Picaridin is recommended by the CDC as a preventative measure against Zika and other bugs that may carry different diseases and has shown to be just as effective as DEET. Permethrin is a popular choice for outdoors enthusiasts who are exposed to mosquitos on a more regular basis than others. To minimize exposure to foreign substances touching their skin, Permethrin can be applied to clothing which can be worn and even washed several times before needing another application of the repellent. Clothing sprays have gained in popularity because they are primarily unscented, last a long time, and can withstand being washed without needing to be reapplied each time. Soaps are another option for those who want to avoid sprays, but it requires that you use the soap before going outside and it may not be as effective as a spray. Mosquito sticks and candles, release compounds into the air that deter mosquitoes and these can be an excellent addition to a spray. These products mainly treat the air within a small area and must be kept burning to have any effect. Some of these burnable products can be a problem for those with respiratory issues or sensitivities to certain smells. If someone has a respiratory-related illness or health condition, it may be best to avoid these products as it is possible for them to cause irritation.